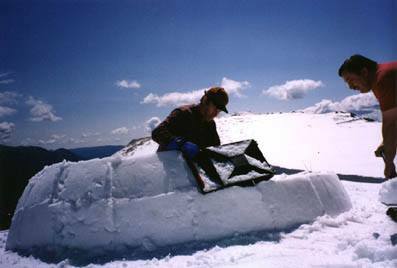 LYONS -Just when everyone is planning summer camping and hiking trips, cookouts and pool parties, Ed Huesers is trying to keep his cool building an igloo. Huesers is hoping to market the ICEBOX® – his newly designed igloo making kit – by October in time for the winter camping season. Huesers and his Longmont partner, Guy Menge, are avid winter hikers and snow campers: They have hiked into remote areas carrying seven-pound tents and thought it might be easier to build a snow cave rather than bringing in a heavy tent. But building snow shelters can be time consuming and exhausting. “It was a lot of work and we got pretty tired,” Menge said. “We started looking for overhangs and then we began using our sleeping pads as a form to build walls up to the overhang. It took less snow and less time than a snow cave.” But the walls were unstable and you had to find an overhang. Menge and Huesers began talking about building an igloo and they designed the first prototype. Menge and Huesers were naturals for the job. Menge is a mechanical engineer and owns his own company, SolidTek, that designs molds using a computer. Huesers is a mold maker and owns his own company, Inventors Aid Service in Longmont. The two friends have been designing and making molds for plastic injection molders since the 1970s, when they started working together in North Dakota. 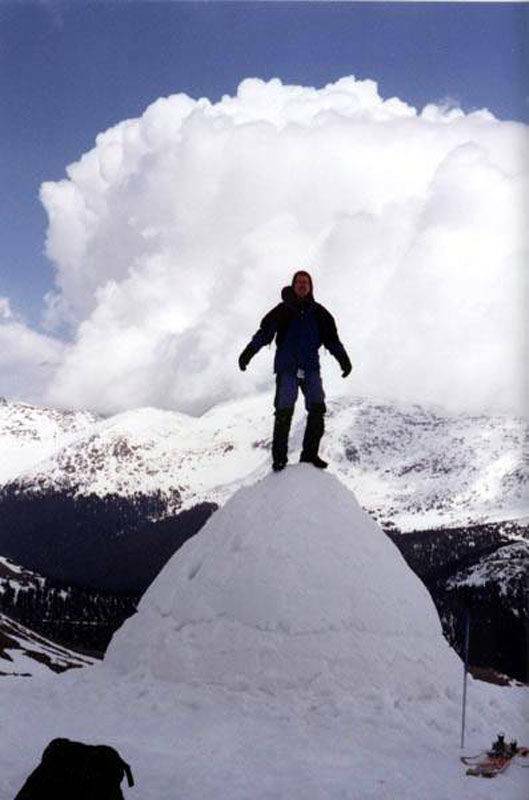 The two say the secret to the success of the snow dome is the pole, which extends out from the side of the plastic form to the center of the igloo. A spike secures it to the center of the floor, where it swivels around with each layer of snow. The pole has eight notches and it is shortened by one notch for each layer of snow, pulling the walls in slightly and creating a parabolic curve up to the top where the form is used to fill in the hole at the top of the dome. The form won’t work without the pole. Now the two entrepreneurs plan to start their own company, Grand Shelters. They have a web page on the Internet, where they will sell the ICEBOX® for about $140. The inventors hope to have the ICEBOX® in hiking and mountaineering shops in October. They are already designing windows and doors for the igloo, which will be sold as accessories. The ICEBOX® weighs 4-1/2 pounds and snaps together in a 2-inch-thick package for backpacking.A 9-foot or ll-foot igloo can be created with the same kit. A 9-foot igloo will sleep about four people tightly and the ll-foot sleeps about six people. The igloo will last about two months, Menge said, making it usable a number of times. It will heat up to about 40 degrees with people inside. The inner layer will melt a little and the water runs down the sides in little capillaries. Air must circulate through a vent in the door and roof to prevent a lack of oxygen. 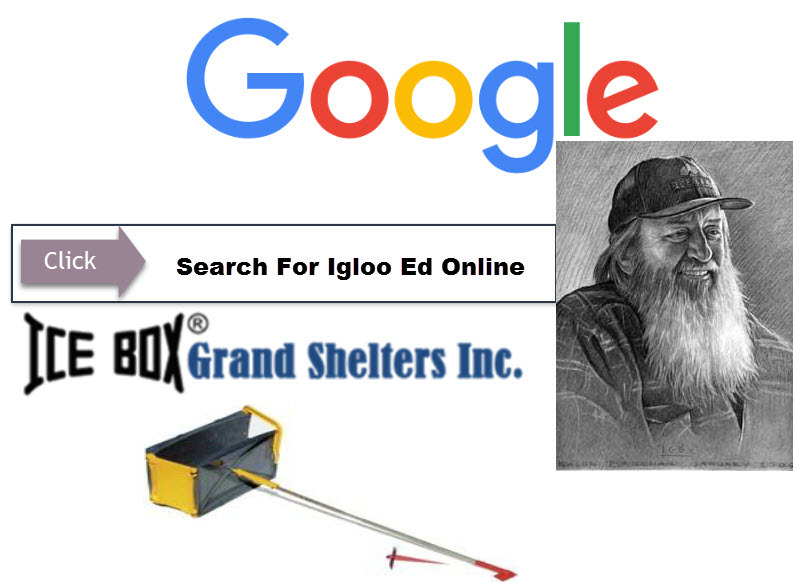 Igloo kit available in stores for the winter season.